Description: Perennial with rhizomes c. 5 mm thick and emergent tufts of leaves arising along their length. Leaves triangular in cross section, to 80 cm long, 5–10 mm wide. Inflorescence to 10 cm long and 2.5 cm wide. 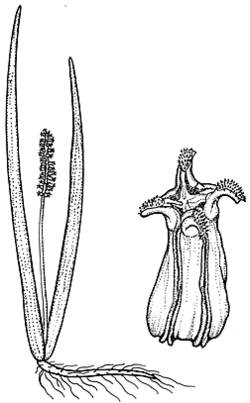 Carpels 6–8 mm long, sessile, each with a spreading beak. Distribution and occurrence: Grows in swamps or shallow freshwater in heavy clay; north from southern Sydney.